Here is another great example of a unique and interesting film that Arrow Video brings out for the masses of movie lovers. Arrow Video always amazes me with unique choices in cinema and Suture is another great example of that. Suture is a twisted neo-noir style of film that plays with the mind of the viewer. It’s a one hundred percent, unique experience that lingers with you long after the film is over. The plot is unique and yet has that classic Noir setting. One of your main characters is Vincent. Vincent tries to fake his own death. In the process he plants a car bomb in hopes he will kill an almost identical half-brother named Clay. Clay ends up surviving and Vincent takes it upon himself to try and kill Clay once again. This is a unique murder style mystery that is thick with suspense and a classic Noir setting that breaths an originality into the pulse of movies. Great performances by all. Dennis Haysbert is brilliant as the character of Clay. I have always been a huge fan of Dennis. I will always remember him as President David Palmer in the one of a kind awesome action packed series 24. Dennis I feel is an actor that never gets the lime light he deserves. He is such a powerful performer and anything he does stands out and Suture is a prime example of that acting brilliance. Also starring the wonderful Mel Harris. She is a fantastic performer that I feel also has never gotten the limelight she deserves. She is a beautiful example of sophisticated performance. Also starring another very underrated actor Michael Harris. Harris is a brilliant performer that allows you to become a part of his characters. He too has never gotten the lime light he deserves. Suture has a collective of actors that stand out and are memorable in many wonderful ways through a classic style of performance. Interesting to note about this film is it had two directors. David Siegel and Scott McGehee. There visionary work and unique sense of dread added an atmosphere of an older setting and yet an abandoned town like structure. The movie flowed with a darkness style of destruction. The unique black and white setting gave it the perfect formula the film needed. This is an independent film all the way. The creation and conclusion is an amazing reality of storytelling and execution. Scott McGehee and David Siegel has gone on to direct some very good films a few to mention 2001’s The Deep End and my personal favorite 2012’s What Maisie Knew. 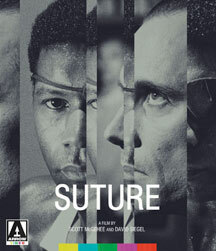 Scott and David also wrote Suture which is another prime example of the uniqueness of the film. Both are very talented visionaries that stand out in what they are doing in film. Suture won some awards, Scott and David won Best Director at the Sitges – Catalonian International Film Festival. And also Greg Gardiner in 1994 won best Cinematography at the Sundance Film Festival. Arrow Video has done this film justice in creating a wonderful Blu-ray/DVD outlet. The film has never looked any better. This is my second time seeing it and it’s like a new picture. A beautiful transfer to Blu-ray. An amazing new outlet to this wonderful forgotten about film. The audio is spot on perfect. The video is crisp, vibrant black and white tones. The product is a golden ticket of what to do to a film on a Special Edition Blu-ray DVD combo. Something that your always guaranteed with Arrow Video is the massive special features they give. They are one of the best companies to supply extras that are unique and worthy to praise. And Suture is no different. It comes with wonderful extras. Again Arrow Video has aced this Special Edition Blu-ray DVD Combo. A wonderful example of how to treat a film and give it the brilliant audio and video that it deserves. The special features that it deserves. A wonderful example of a top quality product that should be highly praised for its ultimate merit on film. Arrow Video does it again, highly Recommended.